This is an interesting pair of wines from newcomer Flint Vineyard. England is best known for sparkling wines, and rightly so. Could there also be a future for still wines? I’m not convinced they show as much promise, but these wines are pretty good. Ben and Hannah Witchell established Flint Vineyard in Norfolk. The east of England is the sunniest and driest bit of the country, but there aren’t many vineyards out here because the soils aren’t as immediately compelling as some of the chalky terroirs in Hampshire, Sussex and Kent. But Ben and Hannah managed to find a really promising site in Camphill Farm, owned by Adrian Hopewell, and in 2016 they planted the vineyard in conjunction with him. The first harvest will be 2019. In the meantime, they’re working with growers in East Anglia who supply them with grapes, and this is the debut vintage of their label. 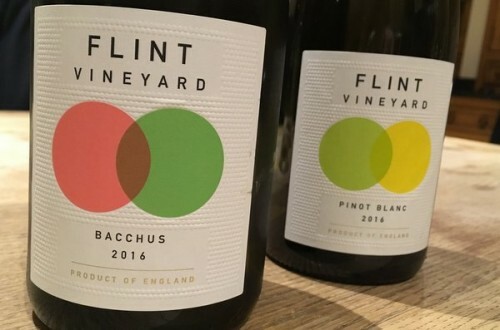 Bacchus is a particular interest to Flint, and Ben was awarded a grant of £23 000 to research this variety by the Eastern Agri-Tech Growth Initiative. Bacchus is the UK’s third most widely planted grape. It’s a cross between Riesling and Sylvaner, and it produces aromatic wines that are quite Sauvignon-like. Bacchus is actually a cross of Muller-Thurgau and a cross of Riesling and Sylvaner.